The word “service” has special meaning at Pasternak & Fidis – and it applies to community involvement as well as to our clients and to our profession. In recognition of the firm’s commitment to community service, we closed our offices on May 9th for a day of volunteer work at Red Wiggler Community Farm. We (gladly) exchanged our briefcases, law books, and business attire for hoes, shovels, and workwear to spend a day outdoors working alongside – and at the direction of – the wonderful, hardworking staff and growers of Red Wiggler, many of whom are disabled members of our community. 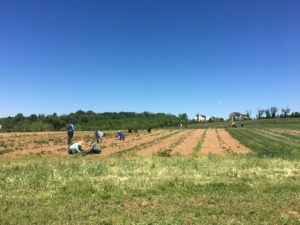 Red Wiggler is a working farm located in Germantown, Maryland, which supports youths and adults with and without disabilities with employment and vocational training through the cultivation and distribution of sustainable, organic produce. The growers with whom we worked, and who showed us how to accomplish our tasks, have been employed at Red Wiggler for many years and are expert farmers. Our tasks included beet thinning, bug squashing, thistle and weed removal, filling bags of rocks, and preparing beet greens and pea shoots for distribution to Red Wiggler’s Community Supported Agriculture members. We all worked hard and got dirty, and were rewarded with valuable experience and education into the knowledge, skill, and labor required to deliver top-quality vegetables to consumers through sustainable farming methods. Most importantly, we were reminded that everyone in our community – including a troop of office-bound legal professionals – can contribute to the health and well-being of our neighbors and to the sustainability of our lands.